Hulu is trying its hand at Less Than Zero. The streamer is developing a drama based on author Bret Easton Ellis' 1985 novel and subsequent 1987 feature film. The reboot, which is in development, follows a college freshman who returns home for Christmas to spend time with his ex-girlfriend and his friend who struggles with addiction. The Hulu take will explore the culture of wealthy, decadent youth in Los Angeles. Andrew McCarthy starred in the '87 feature film opposite Robert Downey Jr., Jami Gertz and James Spader, with Harley Peyton adapting Ellis' book; 20th Century Fox owns rights to the franchise and distributed the feature. Ellis' book, named after the Elvis Costello song, explored themes of nihilism, with the author credited with helping to create a new culture of celebrity with figures like Paris Hilton and the Kardashians. As Hulu searches for its next water-cooler hit following The Handmaid's Tale, the streamer is also developing a take on another seminal novel: Ralph Ellison's Invisible Man. The project, which has been in development since October, has now hired Marcus Gardley (The Chi, Z: The Beginning of Everything) to pen the script. John Callahan will exec produce the drama, with the Ralph and Fanny Ellison Charitable Trust also involved. The trust owns the book, with Hulu landing the rights to develop a series based on the 1952 novel last year. The award-winning book is told from the point of view of an unnamed African-American narrator who considers himself to be socially invisible because of the color of his skin. Here's Hulu's official logline: "Invisible Man follows an unnamed African-American narrator whose color renders him invisible. He recalls stories from his life — first growing up and attending college in Jim Crow South then living and working in 1930s Harlem." The news comes a day after Hulu canceled drama The Path after three seasons as the streamer continues to refine its scripted roster with big swings including Castle Rock, Catch-22 and more. 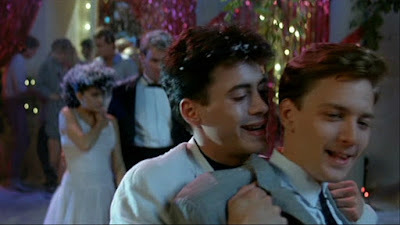 Andrew McCarthy James Spader Jami Gertz Less Than Zero Robert Downey Jr.
Labels: Andrew McCarthy James Spader Jami Gertz Less Than Zero Robert Downey Jr.